Elvis is in the building for his tour, driving a 1955 Pink Cadillac. Explore on this historical tour of Las Vegas with Elvis as your personal guide. Highlights of your tour include Fremont Street, the Bellagio Fountains and the Welcome to Las Vegas Sign. Elvis will sing you a few songs and tell stories of both Las Vegas and Elvis history. 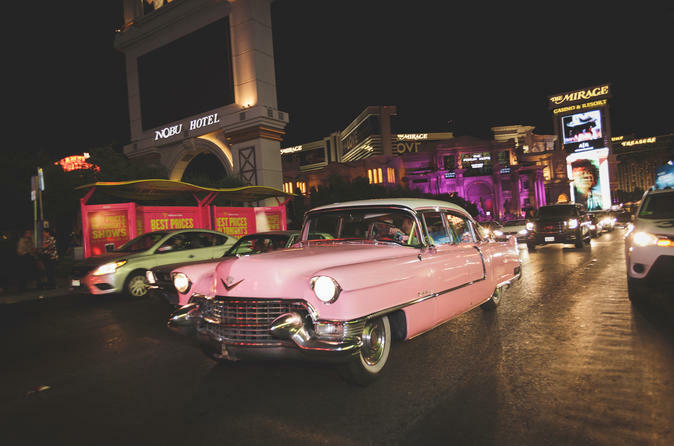 The Pink Cadillac Tour is a historical tour of Las Vegas in a vintage 1955 pink Cadillac with Elvis as your personal tour guide. Your day will begin with a private tour with Elvis picking you and your 3 friends up from your Las Vegas hotel. As you chat with Elvis he will point out all of the wonderful sights of Las Vegas. Your first stop will be at the Bellagio Fountain where Elvis will serenade you with a song of your choice while you enjoy the scenery. You next stops will be Fremont Street, and finally the world famous Welcome to Las Vegas Sign were you can take pictures with Elvis himself. Enjoy a fun tour of Las Vegas and be serenaded with your favorite Elvis songs. At the conclusion of the tour Elvis will bid you a fond farewell as he escorts you back to your hotel.